In the 1950’s smoking used to be seen to be “cool”. By the 1970’s there was indisputable evidence it was linked to cancer. The Tobacco companies hired PhD scientists and government lobbyists to refute these allegations. But now there are class action law suits against these tobacco companies. Pic. 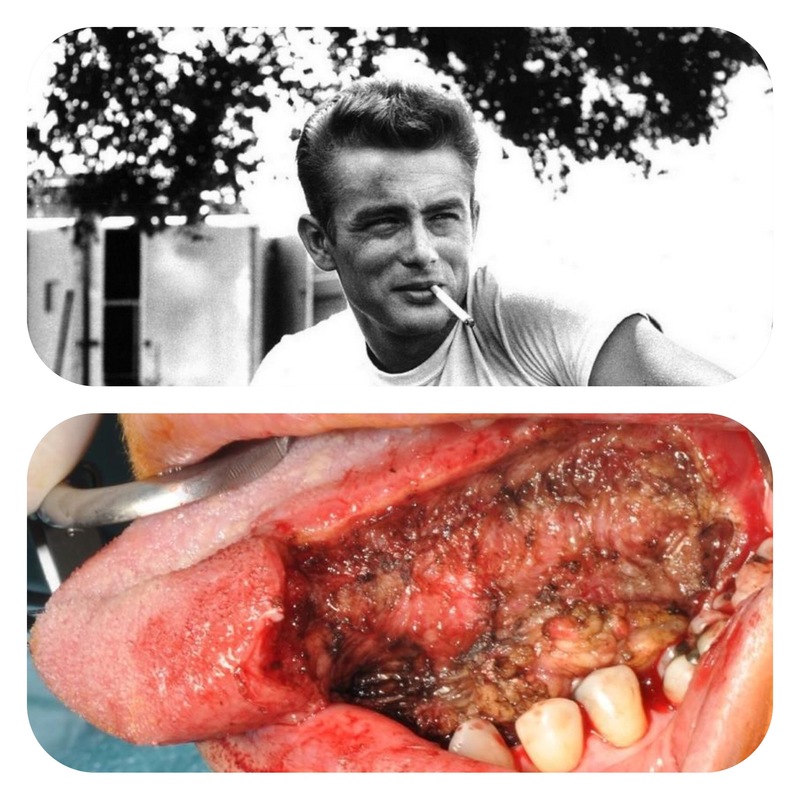 James Dean smoking (top) and oral cancer (bottom). Alcohol is the cheapest and most legal drug available in shops. There are rarely if any health warnings on the bottles/cans/containers. It ruins many lives and yet in supermarkets its cheaper than water. Another potential for class action law suits against manufacturers and retailers? Not to mention the cost to NHS, industry and family life. 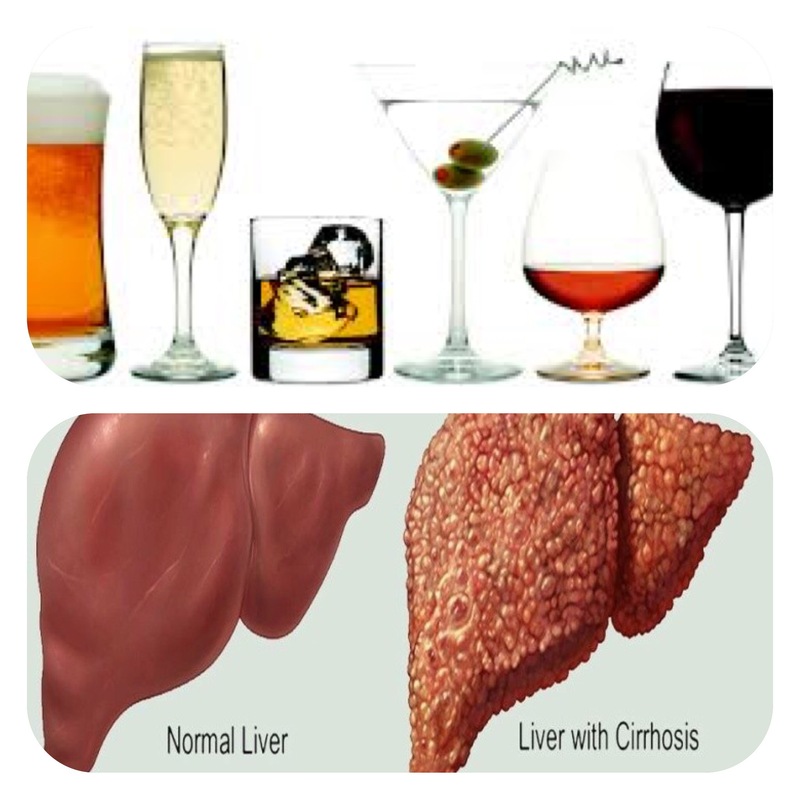 Pic Range of alcoholic drinks (top), normal and cirrhosis (below). When it comes to food we were always told fat was bad and in excess of course it is, but now public enemy no 1 is sugar. Sugar is the major cause of tooth decay, obesity, diabetes and heart disease. Our bodies require a certain amount of glucose as fuel, this is a single block, disaccharides are two blocks and polysaccharides are long chains of glucose found in starchy foods like potatoes, rice and pasta. These are broken down to monosaccharides (glucose). Any excess is converted to fat and if there are problems with this mechanism diabetes can occur. 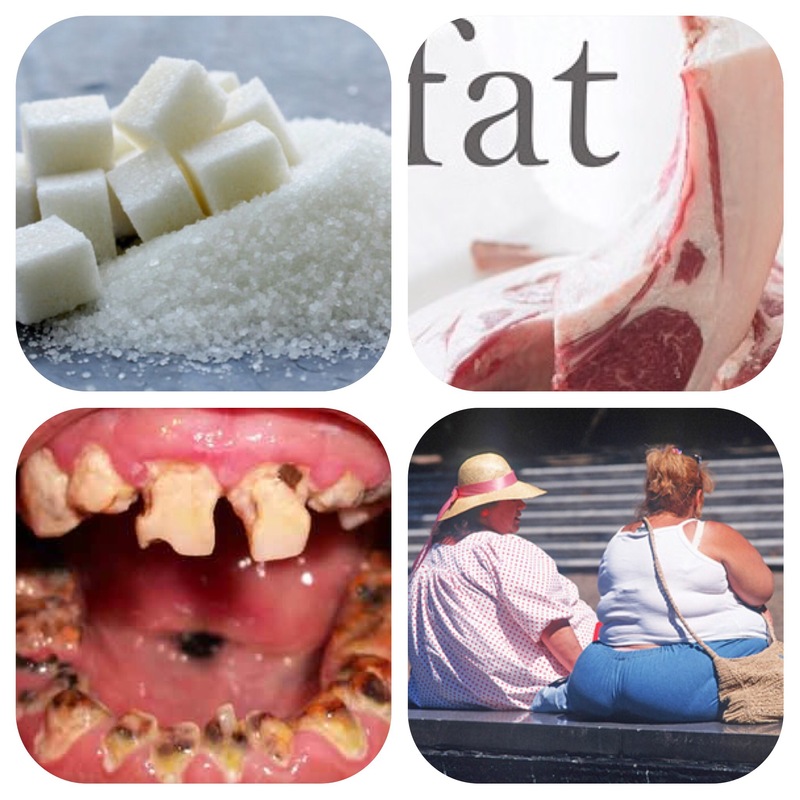 Pic sugar causing tooth decay and obesity and fat causing obesity. Farmers globally are growing corn to make high fructose corn syrup, which a leading US manufacturer uses in over 1000 products-from sauces to mayo to soup to breads-read the labels, I won’t mention the name of the company, but it is in the UK. Once again the sugar companies have hired their PhD scientists and lobbyists to say sugar is not that bad. Again evidence is out there and is being swept under the carpet. My advice is if there is any added sugar in any form e.g. Glucose, dextrose, galactose, lactose, fructose, corn syrup etc think twice about buying it. Again class action law suits against sugar manufacturers and retailers is inevitable. Not to mention the cost to the NHS of treating tooth decay, obesity, diabetes, heart disease and their associated problems, which I hasten to add we are in a global pandemic and a lot of this is preventable. As an avid food lover it’s nice to go out for meals and treat oneself, but lots of restaurants and takeaways make food which is either too rich/fatty, use excess sugar and food colouring/ additives. Again as everything above one needs to exercise caution and moderation. Finally and of real global concern is the use of non biodegradable packaging such as plastic bags, plastic packaging, polystyrene fast food containers and coffee cups. 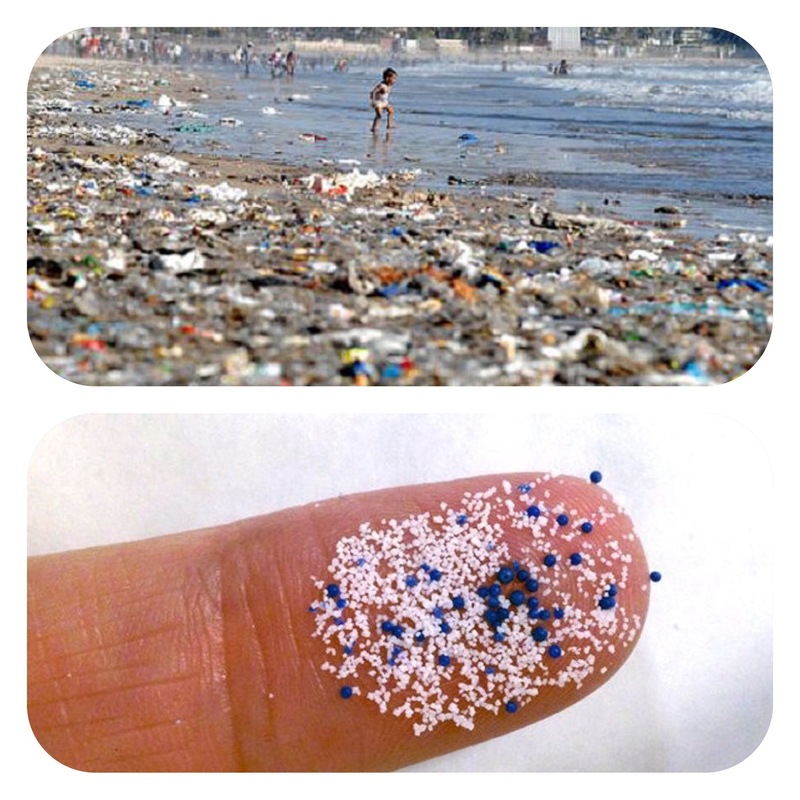 These take 100’s of years to breakdown into nurdles and then become micro beads and make their way into the water and seas/oceans. They then are eaten by marine livestock and either kill them or WE end up eating them. Now in this day and age of evidence based research it’s early days. Not enough data is available on this, or if it is it is being covered up. We don’t know what long term damage, if any, this is doing to our bodies, but I know the mess it makes on the sea shores!! I was asked by M&S to help in a local beach clean in the past and it’s astounding what we found. Next time you ask for a fish and chips, or have your prawn sandwich or crab or lobster, just think are you eating plastic as well???? I remember the good old days when a good fish and chip was served in yesterday’s newspapers-bring those days back because the taste was much better. Also if you do order hot food in polystyrene containers the heat of the food can melt the polystyrene and you can actually taste the plastic, same with coffee. Again if it is shown to be detrimental to health then class action law suits galore. I have been asking manufacturers, wholesalers and retailers to take this on board. What we should be doing as a society is really boycotting these products, bringing our own coffee cups/containers and caring more for our society, health, planet and future for our kids and the flora and fauna of the land and sea. I would urge you to share this message with your friends and families asap. Please follow my blog and twitter feeds and any comments are welcome. The food industry’s two deadly crimes: Sugar and packaging. Belfast Foodman, the pseudonym of a Northern Irish dentist, speaks out. Irony! The ad. that WP placed below this piece on my PC was for Paris Dessert Heaven ice cream! Fun fact: Sugar is 8X as addictive than cocaine! Correct, why are we all being lied to and cheated? So true! In the end, it’s ALL about $$$ forv them! Oh, well written. What a great post. Anyway, dropped by to offer my thanks for your recent decision to follow Learning from Dogs. Please do consider writing a guest post for my readers. They would enjoy that.